This combination of Pycnogenol (26mg) and Grape seed extract (24mg) as antioxidants offers excellent skin supporting benefits by aiding in the maintenance of collagen integrity. 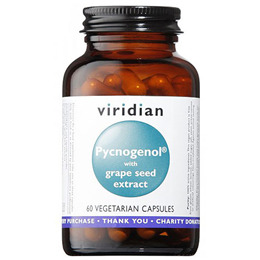 Grape seed extract offers similar properties to Pycnogenol to enhance the formula. 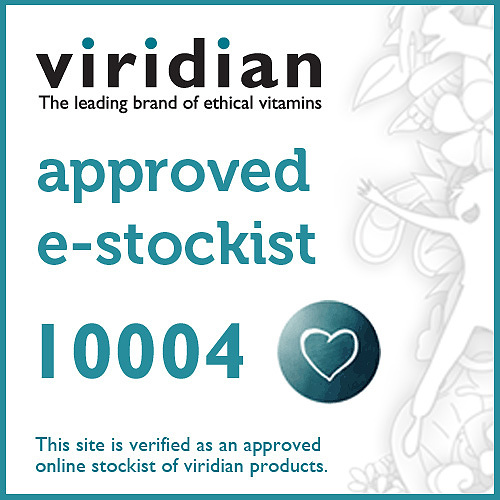 Viridian’s grape seed extract is extracted from the grape seed using water, therefore the process is not carried out under heat conditions. Pycnogenol is a patented extract of pine bark from the Maritime Pine trees grown in the South West region of France. Pycnogenol™ has been shown to be 50 times more effective than vitamin E and 20 times more active than vitamin C as a free radical scavenger. With more than 200 published researched papers (from ageing to vascular health), Pycnogenol is one of the most extensively researched natural remedies. Grape seed extract is a rich source of the plant flavonoids Proanthrocydins (OPCs). The OPCs are the pigment materials which give flavour, colour and aroma to many plants and fruits. Grape Seed Extract powerful antioxidant properties (typically 92-95% OPC`s), supporting and maintaining cardiovascular health. Also it can be a high potency collagen protector and free radical fighter. Provided here in a base of alfalfa, spirulina & bilberry. The antioxidant nutrients have the ability to protect the body from the activity of highly-reactive molecules called free radicals. Free radicals have the potential to create havoc with the health of the body`s cells. Pycnogenol™ is a patented presentation of pine bark extract, which contains the family of antioxidants known as proanthocyanidins. Grape seed extract contains 95% polyphenols. Below are reviews of Viridian Pycnogenol & Grape Seed Extract - 60 Vegicaps by bodykind customers. If you have tried this product we'd love to hear what you think so please leave a review.